As you walk around the bustling streets of South Africa’s capital city, Pretoria, you would never know that just a few kilometers away, high above the city, there sits a 52 hectare park that is a direct product of Mandela’s vision. Freedom Park is dedicated to narrating the history of conflict in the country from pre-colonial to the post-apartheid period. More than a narrative however, Freedom Park is a physical experience; one which raises important questions about access to history and memory in a country that has made tremendous progress in reconciling its violent history but which still bears many scars from decades of apartheid rule. Freedom Park was born of the 1995 Truth and Reconciliation Commission and its purpose is explicit: “To provide a pioneering and empowering heritage destination in order to mobilise for reconciliation and nation building in our country; to reflect upon our past, improving our present and building our future as a united nation; and to contribute continentally and internationally to the formation of better human understanding among nations and peoples.” Work on the park began in 2000 and it opened to the public in 2007, although work continues on physical aspects of the site and on the development of permanent exhibits. Visitors are escorted to the top of a hill in small carts where they can then walk about the park along various circuits. I started with the Wall of Names, a visually stunning structure almost 700 metres long, which winds around the top of the hill. It is reminiscent of the stark and powerful simplicity of the Vietnam War Memorial in Washington, where the sheer number of names inscribed on the black granite give pause to the impact of war. In Freedom Park, the names of individuals killed during eight conflicts are inscribed on sand-coloured stone that absorbs the intense heat of the midday sun. The categories range from Genocide, Chattel Slavery, the South African War, the First and Second World Wars and the Struggle for Liberation, but there are smaller headings such as International Solidarity, the Cradock Four Killings (the 1985 murders of United Democractic Front activists) and the South African Defence Force Raids. There are hundreds and hundreds of names on the wall yet the categories are not contextualized and so the independent visitor is left to surmise the curatorial narrative (had I taken a guided tour, presumably a lot of my confusion would have been cleared up). As I walked around, I wondered about the selection process for the categories and events captured on the wall. It seemed rather random and selective. So too did the names. Where did they all come from? Perhaps a team of researchers is dedicated to the task? I am not sure although I did learn later that people can apply to have the names of specific individuals included in the wall. The on-line form requires that you indicate which conflict they died in along with any institutional affiliation (e.g. National Party or the African National Congress) they may have held. 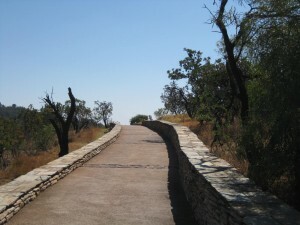 From the Wall of Names, the Mveledzo (a spiral path) takes visitors to a series of sites in the park that are dedicated to contemplation and reflection. 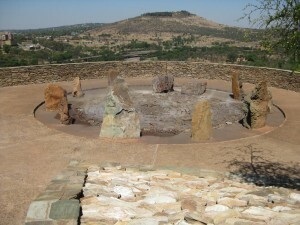 There is a small pond with bamboo rushes and Isivivane, which signifies “commitment to solidarity” and is described as “a resting place for the spirits of those who died in the struggles for humanity and freedom.” It consists of nine boulders, donated from each of South Africa’s provinces, placed in the round, encircling steaming stones. The sound of a waterfall in the background gives the space a soothing atmospheric quality. The vistas from Freedom Park and the Mveledzo in particular are striking and there is no small irony in the fact that one of the most remarkable sights is that of the massive Voortrekker Monument, which was built in 1888 and was intended as a tribute to “the divine right of the Afrikaner people to rule over South Africa that stood symbolic watch over the nation’s capital.” Freedom Park has a much more recent pedigree but in many ways, it too raises important questions about the place of memory and commemoration in a country that is still healing from the wounds inflicted by decades of Apartheid rule. Freedom Park is an inspiring and commendable project. But at a pricetag of over forty million dollars (CDN), it can only be justified if the people it is intended to serve have the opportunity to learn and benefit from its development. This means the people of South African in particular and it means people of all classes and backgrounds. As with so many places of historical memory, so much of Freedom Park’s value lies in the physical experience it can offer visitors. The troubling thing is that on the day I visited the park, I saw only one other person, which made me wonder about how accessible the park is to the people of South Africa. 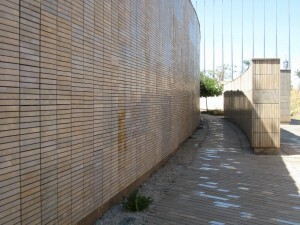 The government of South Africa has created an extraordinary space; one which creates a physical impact for visitors interested in understanding the enduring impact of conflict in South Africa, but unless the site is accessible to all, and used by diverse groups and communities, then its ambitious mission will not be achieved. Worst, the expense of such a park at a time when many of South Africa’s residents still don’t have basic health care, will undermine the need for, and the importance of, making reconciliation an informed, living, breathing reality. For this reason, it will be critical for the park’s managers to think creatively about how to bring the park’s message and narrative to communities across South Africa. In this respect, Canadian historians and heritage experts may be able to offer significant support and assistance. Wouldn’t it be wonderful if the project of truth, reconciliation and historical memory in South Africa assumed concrete transnational dimensions that we could all benefit from? As we go about our work of promoting history and reconciliation in Canada, we may want give more thought to how our local, regional and national projects can be strengthened through partnerships with institutions like Freedom Park that are involved in similar undertakings around the world. As a resident of Winnipeg who spent almost five years in South Africa during the late-70s and early-80s, I was intrigued by the title of this piece. While I found it to be very interesting, however, I am now completely baffled by that title. What is the link to Winnipeg? Mea culpa…I should have been more explicit about my thinking. I was thinking of the important role that an institution such as the Canadian Museum for Human Rights, which will be based in Winnipeg, could play in making global connections and offering support to initiatives such as South Africa’s Freedom Park. Thanks for your comment.